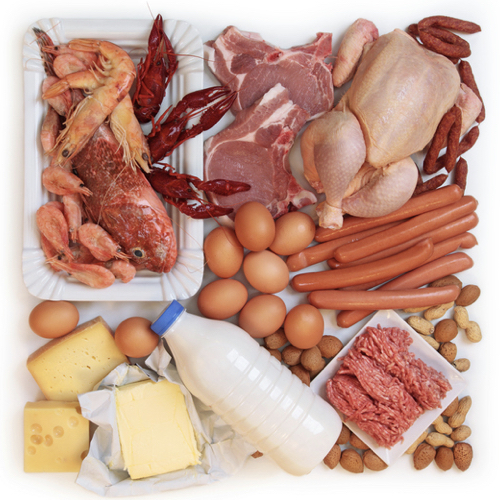 Saturated fat is found primarily in animal foods. The very foods we’re told to increase as we age to prevent muscle loss are being found to contribute to its development. Although the causes of muscle loss are poorly understood, dietary fat has been postulated to have a role in determining protein turnover through an influence on both inflammation and insulin resistance. Our findings are consistent with a number of plausible mechanisms that link fat intake to muscle biology and metabolism and to those involved in muscle loss. There are strong associations between dietary FA profile and the composition of FAs within the sarcolemma (muscle membrane), demonstrating the influence of dietary fat on muscle composition (24). Chronic low-grade inflammation (circulating cytokines) is associated with muscle loss in elderly people (2, 20). SFAs and TFAs increase inflammation; PUFAs, which consist of primarily n–6 PUFAs, are considered to reduce it (2, 26), although certain recent studies have suggested that n–6 PUFAs may also have proinflammatory activities (50, 51). Insulin resistance, which has been associated with muscle loss, is also influenced adversely by SFA and TFA intake and positively by PUFA intake (2, 25, 26, 29, 52). Furthermore, in insulin resistance, there is an accumulation of intramuscular lipid (ceramide and diacylglycerol), which may also be increased by higher SFA intakes (2, 26). Moreover, the Akt/mammalian target of rapamycin pathway (mTOR) (the major pathway that regulates protein turnover) is downregulated by both insulin resistance and the accumulation of ceramide (53, 54). Dietary SFAs increased the production of inflammatory cytokines in muscle cells in an in vitro study (28). In addition, in a human intervention study, PUFAs acutely affected TG-derived skeletal muscle FA uptake and increased postprandial insulin sensitivity (52). High-fat diets may also downregulate the Akt/mTOR pathway (the major pathway that regulates protein turnover), with an animal study showing that a high-fat diet reduced growth of muscle in exercise conditions (55). This entry was posted in Uncategorized on February 24, 2018 by Bix.